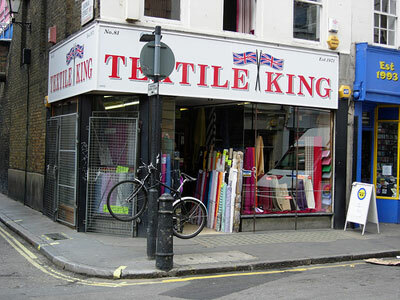 OK, the store isn’t really ‘online’ in the traditional sense, but Textile King in London does now have an email service. If you’ve never encountered the shop, it’s on Berwick Street, Soho and is certainly a place to look and contact for tonics, kid mohair, wool suiting, tweed and especially for stylish shirt material – which is really hard to trace. A lot of tailors also used the place, so it’s worth cutting out the middle man’s premium and going direct. There’s no substitute for going in, but if you want to get in touch and ask for something specifically before you travel, you can email the shop at [email protected]. Failing that, give them a call on 020 7437 7372 or visit the store at 81 Berwick Street, London, W1F 8TW. hi while in london buying fabric i purchased some fabric from your shop i wondering if your shop has anymore of the fabric that i purchased is a fabric with a raised velvet paisley pattern in purple and pink i would be gratfull if you could get back to me and let me no if there is anymore of this fabric to purchased many thanks Evolution couture.